Legio Minimus: Cryptek and Warriors Complete! I am guessing anyone following the blog has noticed a real slow down with posts over the last few weeks. The reason for that is the house we are building is almost at completion and we are going to be moving in over the next 3 weeks. Right now all my Warhammer stuff is already packed up and in storage save for my Necrons and a few paints to finish these guys off for the tournament next weekend. So, that sadly means it is going to be very slow until the start of January with moving, unpacking and Christmas all back to back. On a plus note once we move I will finally have a permanent place to paint and I am going to be getting a bunch more time to actually enjoy this hobby. So come the new year and beyond there shouldn't be any more slow down in posting. I will also be starting some new stuff (I have a couple projects in mind) and I will be taking a break on the Necrons. 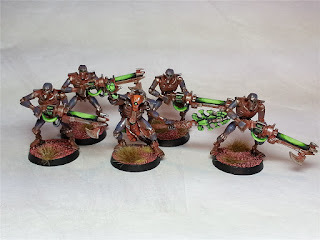 I am really looking forward to trying out some new techniques which includes picking up an Airbrush so I can redo my Eldar in style once that codex gets released at the end of next year. I want to thank everyone who follows the blog and I look forward to getting back to it soon.